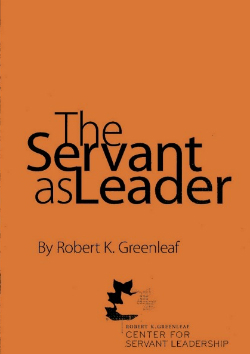 Note: This is the lead post in a series on Robert Greenleaf’s The Servant as Leader. A seminal piece in leadership theory, this small book—a long essay, actually—started the whole field of Servant Leadership studies. See end for a list of articles in this series. Also, go to the main page for my course Leadership for Social Change. When I speak of the “structure” of Robert Greenleaf’s The Servant as Leader, I’m speaking of the structure I see in it, the structure I use when I’m leading a discussion of it. Structure, not to mention logical structure, didn’t seem so important to Greenleaf. ”I didn’t get the notion of the servant as leader from conscious logic,” he says early in his essay. ”Rather it came to me as an intuitive insight. And I do not see what is relevant from my own searching and experience in terms of a logical progression from premise to conclusion.” Furthermore, he admits that there “may be real contradiction in the servant as leader,” and that his own “perceptual world is full of contradictions.” The essay, therefore, proceeds in short, reflective, questioning sections, usually just two to five paragraphs long, none fully or formally developed. As a kind of outline for discussion, however, I see the essay falling very roughly into three parts. PART TWO explores eight Qualities or Actions that both define and develop the servant leader. These are: 1) Withdrawing, 2) Accepting, 3) Knowing (the unknowable), 4) Foreseeing (what he calls the servant leader’s “central ethic”), 5) Perceiving, 6) Persuading, 7) Acting, and 8) Conceptualizing (the servant leader’s prime talent). PART THREE focuses on Community, which he calls “The lost knowledge of these times.” It is here he speaks of those who take up social change as doing so to “heal themselves” from some grief, some wound, some pain. ”There is something subtle communicated to one who is being served and led if, implicit in the compact between servant-leader and led, is the understanding that the search for wholeness is something they share.” That sharing creates community. Writing in 1970, he says, “The signs of the times suggest that…the next 30 years will be marked as the period when the dark skinned and the deprived and the alienated of the world effectively asserted their claims to stature…” and “were not led by a privileged elite…It may be that the best that some of today’s privileged can do is to stand aside and serve by helping when asked and as instructed.” Nearly 50 years later, we begin to see the prescience of this comment. This series seeks to reflect on some of the most important insights of this seminal essay, beginning below with the connection between grief and social change. This article, in part, also introduces a video of a news report on one of my graduate student’s projects in the Leadership for Social Change course. ♦ Servant Leadership in the “Real World”? This entry was posted in Social Change and tagged Leadership for Social Change, Robert Greenleaf, Servant Leadership, The Servant as Leader. Bookmark the permalink.